Tired, beaten-up buildings. Trash blowing in and out of open, broken doors. Streets scattered with ugly memories of a past glory destroyed. Empty stores, vacant malls and parking lots. Suspicous, frightened people hiding from unknown dangers. This is a sterotypical dystopian scene portrayed in so many movies about life in the future. It is a future where some nuclear, catastrophic event has reduced mankind to a primal creature full of fear and anger. Or it is a future which is the result of a greedy, capitalistic society that has used up all the earth's resources. After the devastation it is "every man for himself," as the remnant murder one another over the last bit of food, gas and/or water. Seeing movies like this always shock me. My vision of the future is so different. I can remember in the 60's (I can even recount the 50's!!) our vison of the future was filled with awe-inspiring spectacles of flying cars, electronic luxury, sleek stainless steel buildings and humanity living in wonderous harmony. There was no end to the delights that science & technololgy would usher into our lives. Wow, the future was going to be a place where all problems are solved and humanity basks in the glow of it all. Why do so many imagine a dreary, hopeless existence when they think of the years to come? Because we tend to project on the future what our hearts are screaming in the present. In this "connected" world of social media, internet and amazing technology we have become a more isolated, lonely and fearful society. When we call the bank, the post office, a business, a grocery store we are greeted by a robot who tells us that "she" can understand our commands... "So state your reason for calling..." To make a purchase, we never go and ask the neighborhood hardware owner about the tool or part we need. We sit at our computer and read reviews; then electronically send our order off into cyberspace. We sit at our home computer and "talk" to friends on Facebook and wonder why our lives are not as full and happy as theirs seem to be. We walk out our front door onto a street lined with homes but we don't know who our closest neighbors are. We are hardly aware that we don't "live" where we live. Think about it. To go to school we board an SUV or a bus and travel dozens of miles from our home. Or to the grocery store... the same thing. (Who has a neighborhood grocery store??) Kids? We schedule a play time with the mom ten miles away and take Susie there to be picked up in 2.3 hours. We need some neighborly help with re-tiling the bathroom, we call the professional to come in from parts unknown. Get the point? We truly do not "live" where we live... everything about our lives is farmed out to the professionals or to the proper place miles away. We no longer ask the neighbor for help or even for a cup of sugar for a recipe. What if we changed our future by living a different life in the present? We can leave our children a different legacy. 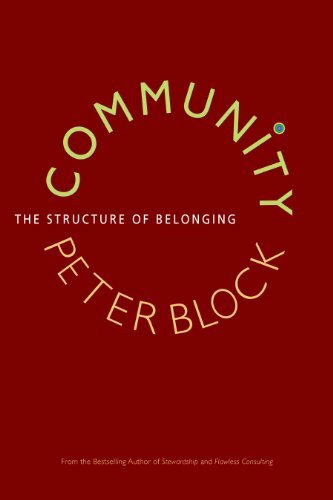 We can make a concerted effort to create community where we live. We can invite our neighbors to dinner and get to know them. We can form a group based on our strengths and hopes, not on our problems and fears. (So often neighborhood groups form to address problems: theft in the immediate area, speeding traffic, teen pregancy, etc.). We can make our lives richer by loving and living with those around us. 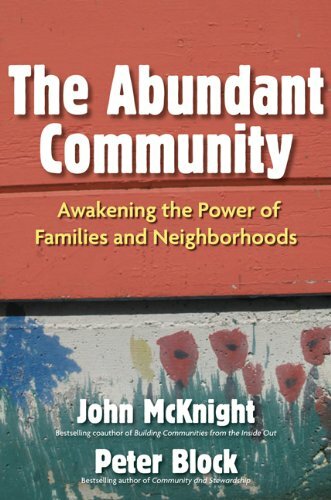 We can create community... a community that envisions a bright future. In the coming weeks, months and years we will be exploring ways of creating community, creating a bright future and learning how to implemnt strategies of love. Check back often and subscribe to this blog! Let's do this thing together.